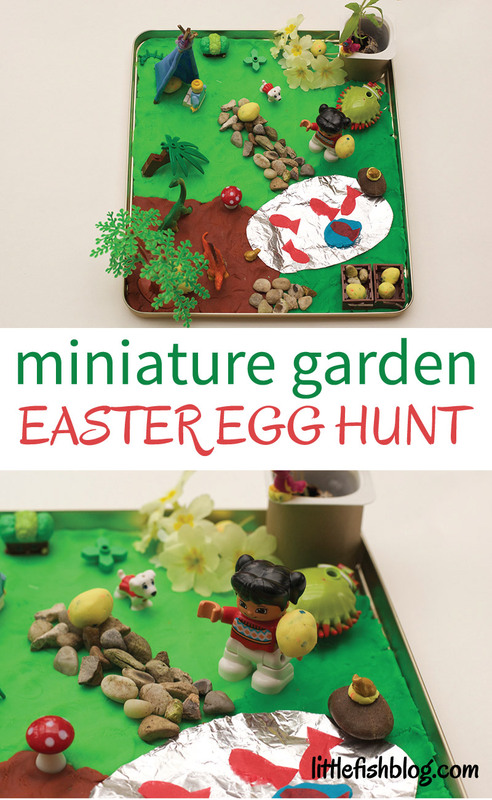 Today I’m sharing a sweet and easy idea – to make your own miniature garden easter egg hunt! I used to love making imaginative little worlds as child – there’s something so magical about creating your own little world. Little M loves making and playing with small worlds too, so I thought this would be a fun activity to do. 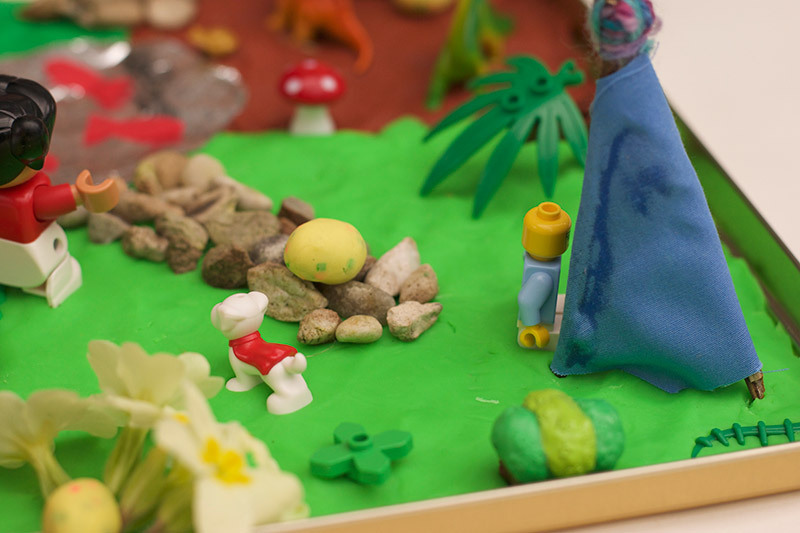 Miniature worlds are so fun for letting kids imaginations run wild! Anything goes, there’s no right or wrong, they are so open ended. You can put whatever you want into your garden. 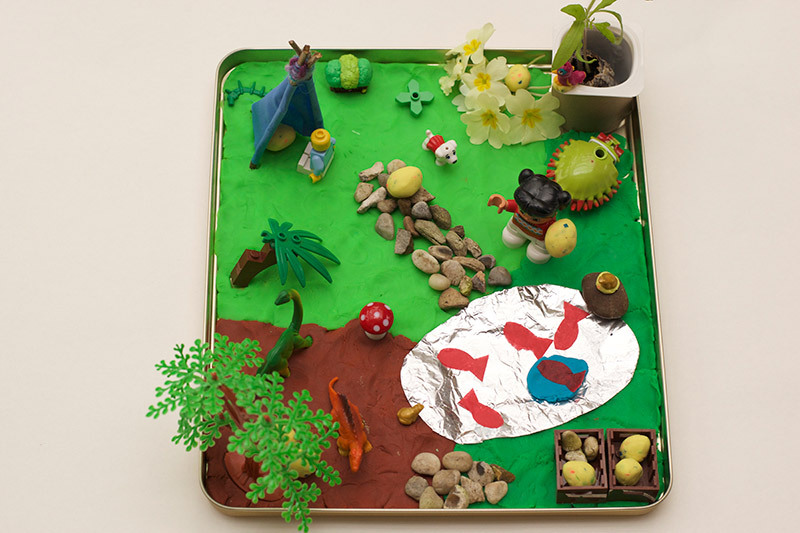 This is a miniature garden with a twist – you can hide tiny pretend Easter eggs in the garden! 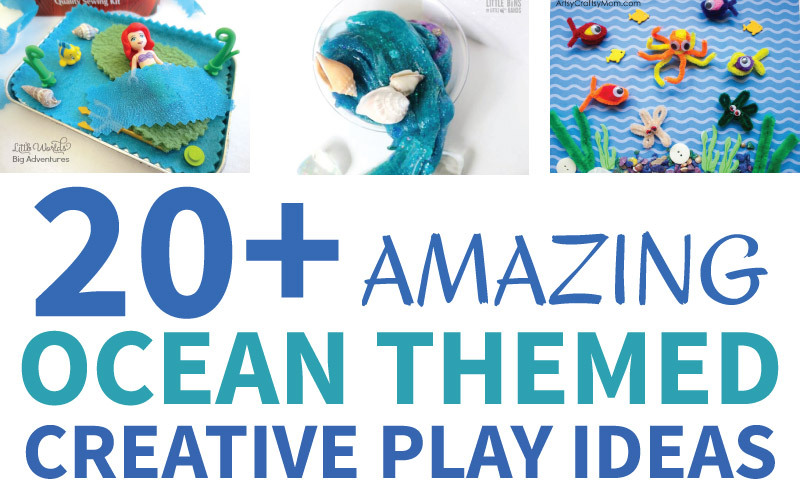 It’s a simple and easy idea and will give plenty of imaginative play opportunities, plus lots of sensory play too, with all those different textures. This is a perfect activity for indoor or outdoor time over the holidays. 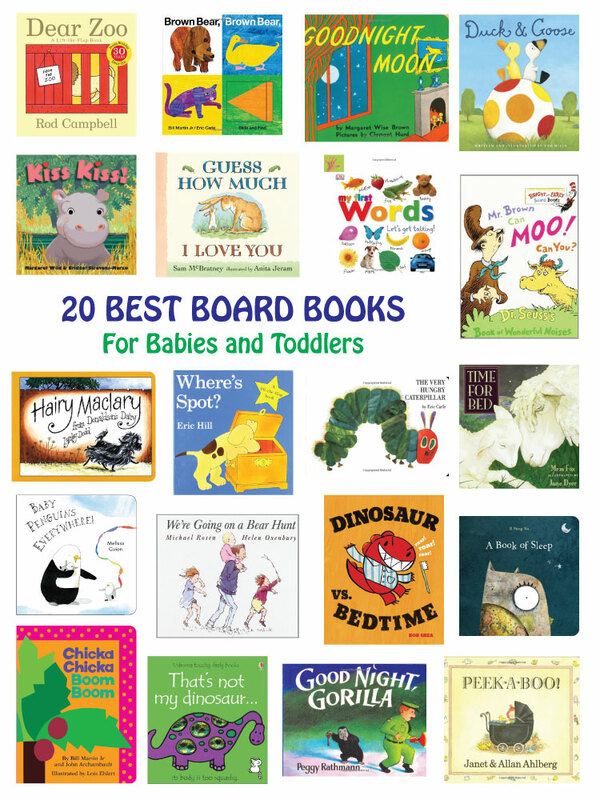 This activity is suitable for children around 3 and up. Just make sure they are not at an age or stage where they will put small parts in their mouths – as always, use your own judgement before you begin. 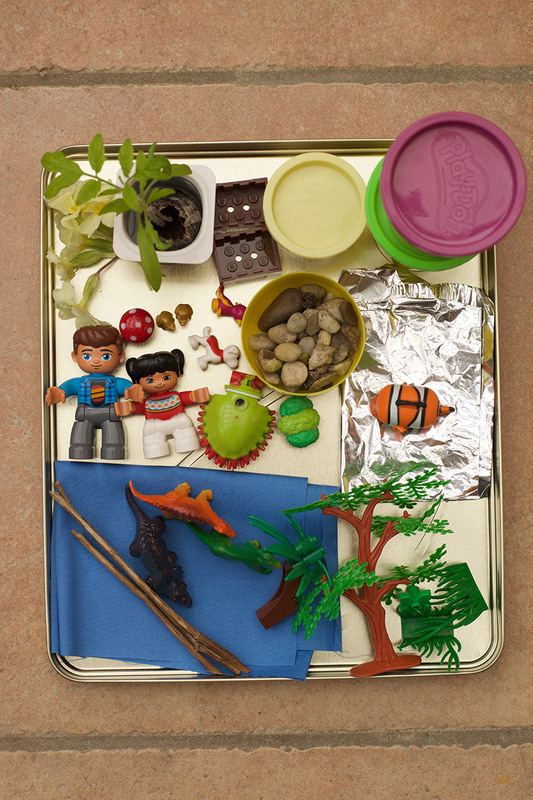 You can give your children a tray of things to choose from, or involve them in collecting their components – or a bit of both. Take inspiration from both outdoors and indoors. 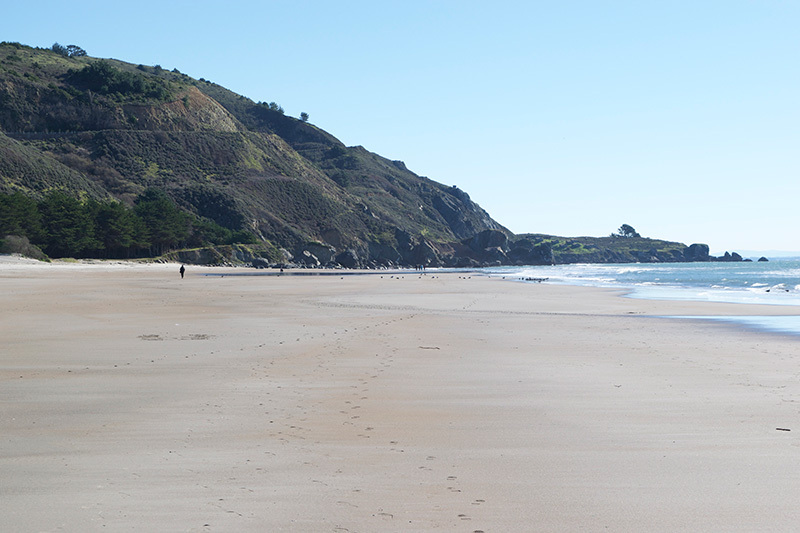 You can find things from nature, plus hunt through all those Legos and mini figures. Children can then make and tinker to their heart’s content. 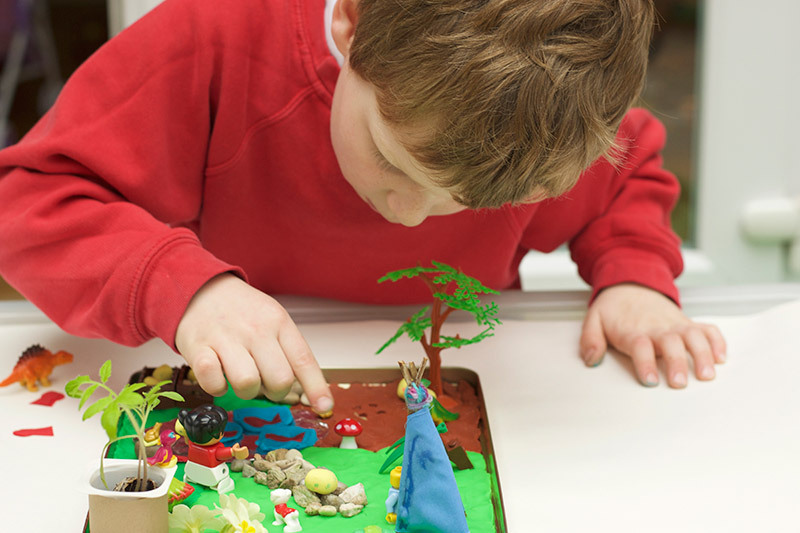 For younger children you could work on this as a joint project together if you like. 1. You’ll need a tin lid, tray or box to make the garden in. You’ll then need to line the container with either play doh, or soil. You could use play doh for an indoor activity, or soil for an outdoor one. If you choose soil, you might like to add some moss, leaves, or grass on top. 2. Use a basket or box to collect your treasures in. Anything that you’d like to add to your garden, or that you could use to create something. You could make small trees out of twigs and leaves, for example, or fences out of twigs. 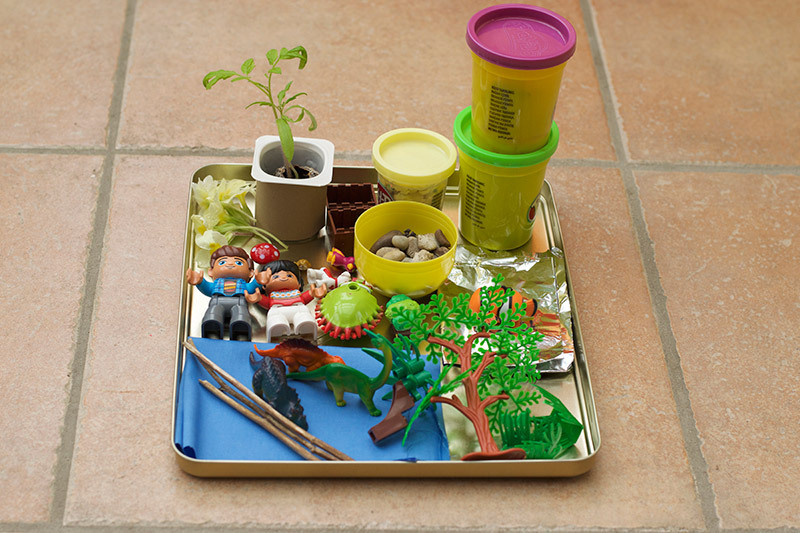 Your children can collect things themselves, or you can present them with a tray as an invitation to play. Disclosure: Affiliate links included, thank you for your support. I’m sure you and your children will have lots of ideas of your own. We were inspired by one of our Mud and Bloom boxes to create our garden. The tiny mushroom and the fabric for the tent came inside one of our boxes. We also used our growing tomato plant as a tree. Can you spot it? 3. 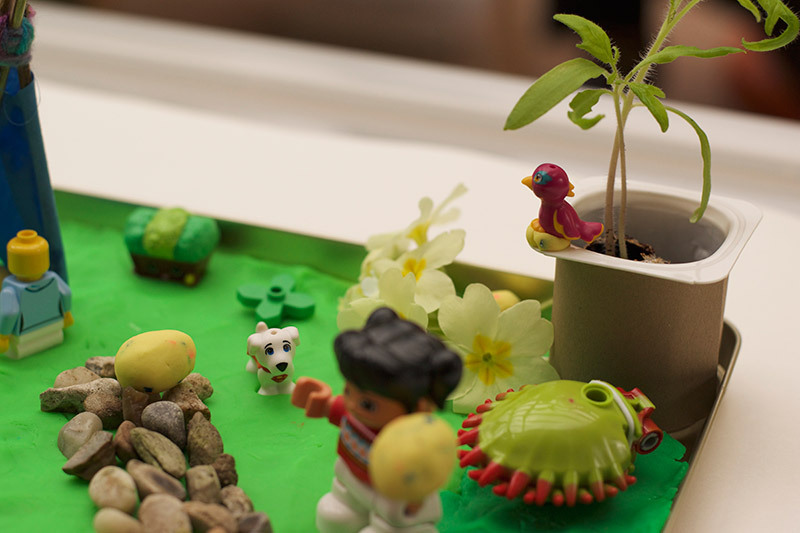 Have fun assembling your miniature garden! Add trees, hedges or plants. Try making a small tent or teepee with a piece of cloth wrapped around three twigs tied together. 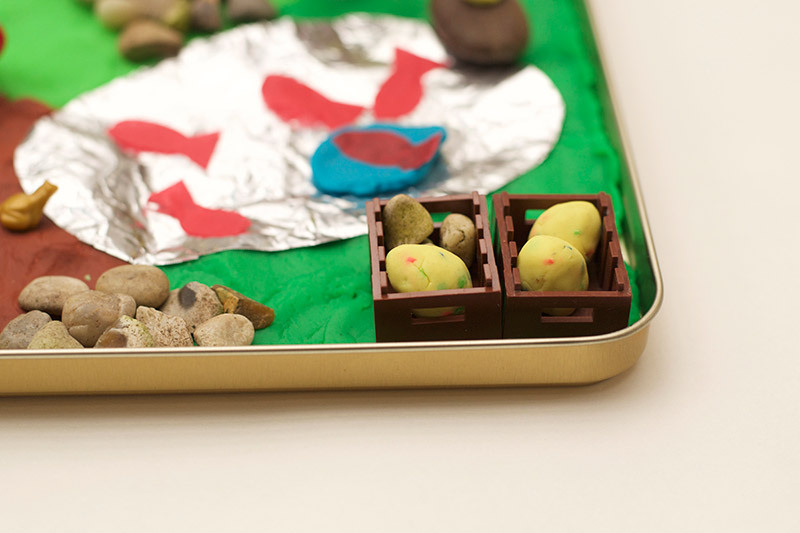 You can make a miniature pond with foil, paths with rocks – whatever you fancy! If you like you can cut coloured paper into shapes to make flowers or fish for the pond. 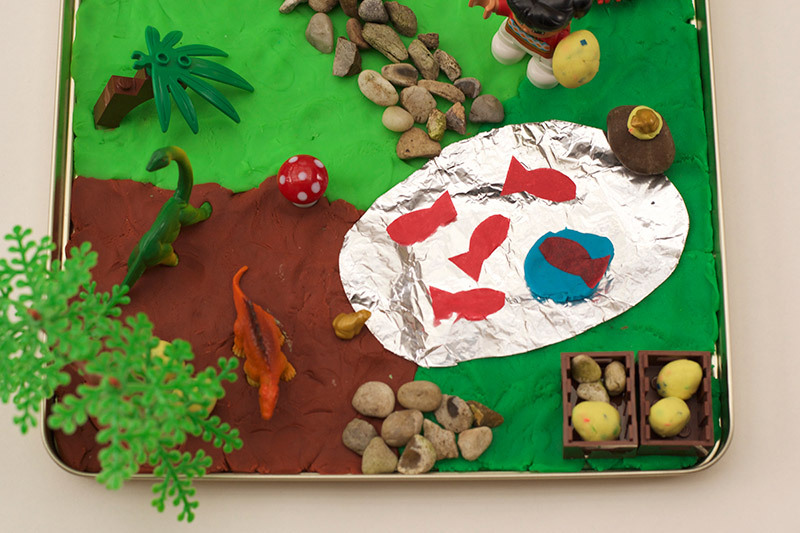 Add animals, or dinosaurs and a few people to go on their egg hunt. 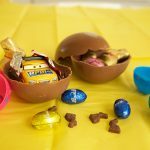 Remember to create a few hiding spots for your Easter eggs as well! 4. 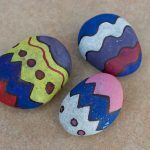 Finish by making some small Easter eggs from play doh and hiding them around the garden. 5. Admire and play with your creation! 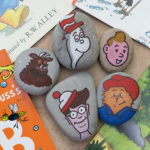 Perhaps a friend could come and help your mini figures find their easter eggs! If you made your garden with soil you can keep this as a outdoor activity for a few days. Just water it now and again. 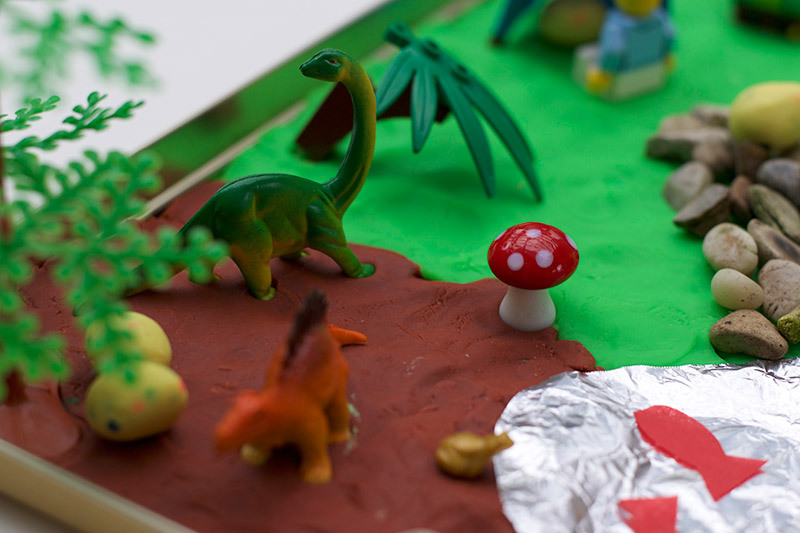 If you used play doh, you can play with it as long as it lasts – either inside or outside. 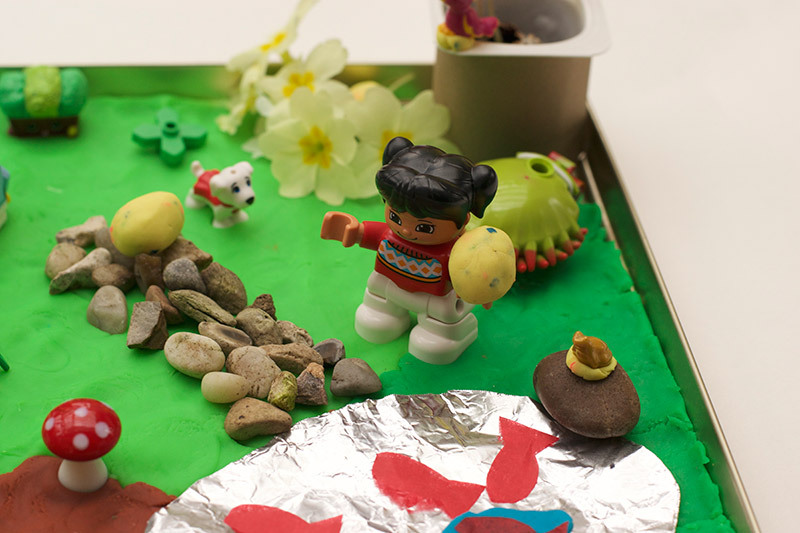 You can cover the garden to help the play doh stay soft for longer. Litte M had great fun tinkering with his miniature garden! We are keen to make an outdoor version next time, with real soil in. But the play doh worked as a great indoor alternative. This was a fun and imaginative activity for an after school play. What will you put inside your miniature garden? Where are you going to hide your Easter eggs? If you like this post you might also like my Snail in the Whale Ocean Tray and my Construction Small World. That’s such an adorable minature garden. My two would love making this. A fab thing for doing today as it is pouring with rain outside! Oh Rosie this is such an adorable idea! Perfect for those rainy days. What a mega cute idea! 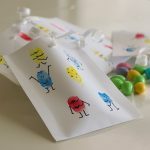 You could even hide real sweets or mini-eggs too for an extra treat!